Twin/double (19’ x 11’6”) on first floor. Bathroom with bath and wet-room rainhead shower. Separate wc. French windows facing east. Twin/double (14’ x 12’6”) on second floor next to sitting-dining room. Bathroom and separate wc. French windows onto balcony facing west. Twin/double (19’ x 11’6”) on first floor. Bathroom and separate wc. French windows facing east. Twin/double (14’ x 12’6”) on first floor. Bathroom and separate wc. French windows facing west. 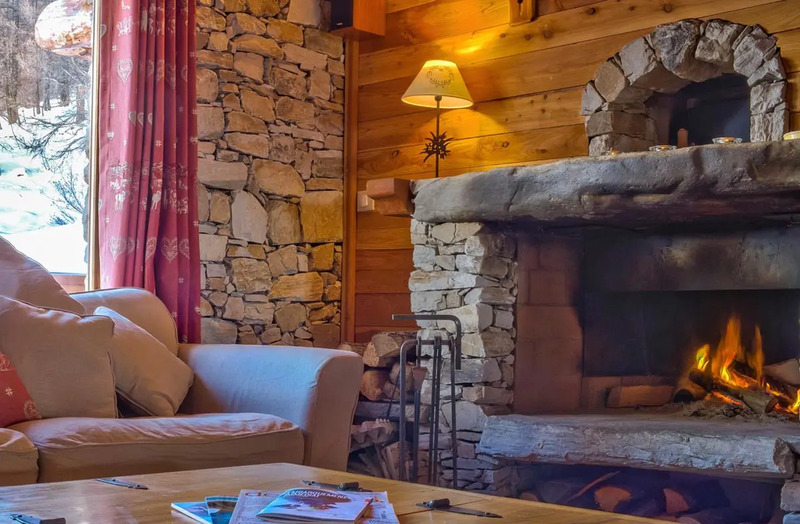 (40’ x 15”) Enormous room on second floor under roof beams, with sofas around a log fire, TV, DVD and WiFi, west-facing dining area, and two separate balconies. The open-plan kitchen is included in these measurements. Sauna with shower and wc on ground floor. Another extra wc on second floor. Boot warmers and glove warmers! 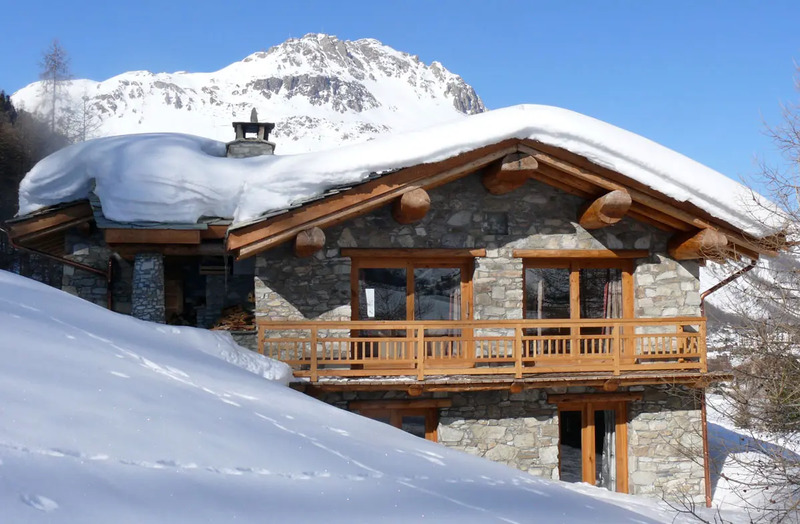 Built especially for YSE, this five bedroom, five bathroom, ski-in, ski-out chalet with sauna and private lift, is one of the smartest in Val d’Isère. 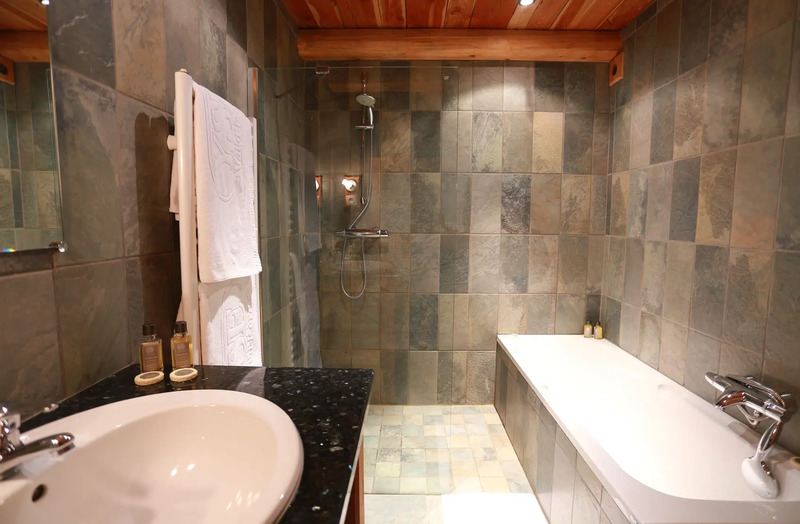 The good-sized bedrooms have small but tasteful bathrooms. 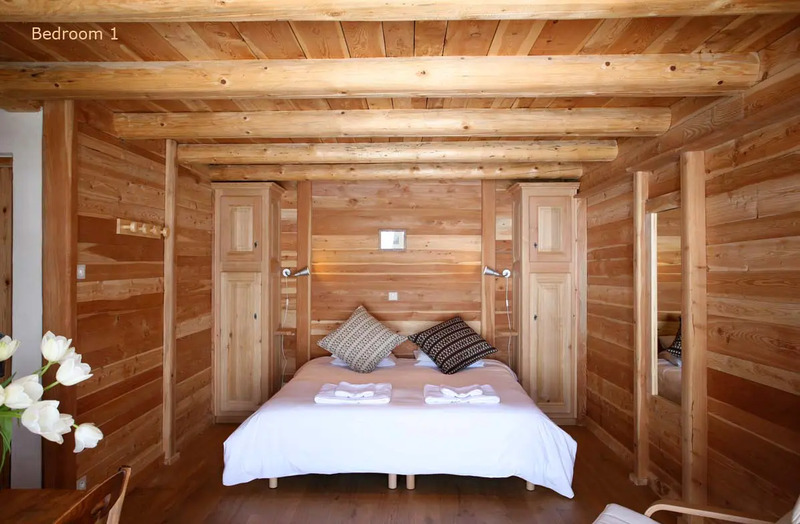 More importantly, each room has a pair of decent-sized beds that fit together to make a huge double if your holiday is going well, or slide apart if it isn’t. And better still, the rooms have picture windows giving breathtaking views of sunrise over the Galise, or sunset behind Bellevarde. The sitting-dining room under the hefty rafters, with its open-plan kitchen, is vast. The dining table was hand-made to our specifications: three diners on the longer sides, two on the ends. That’s the way to get a good conversation going! 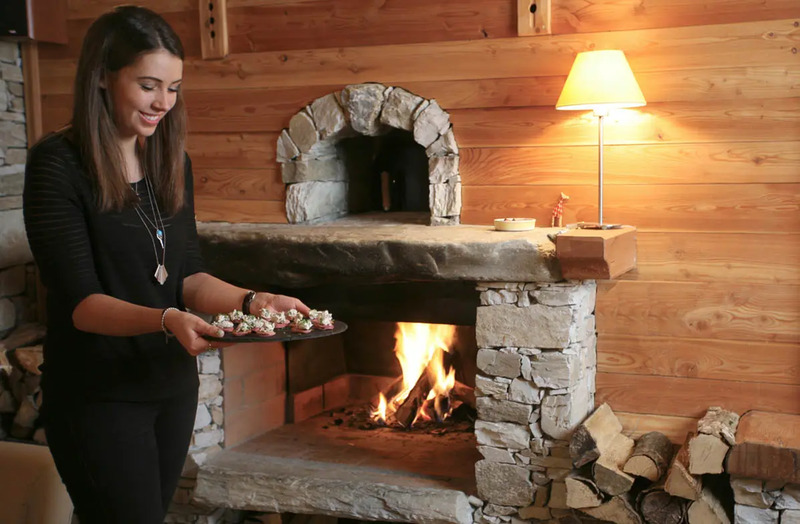 Mealtimes are accompanied by an unforgettable view of Bellevarde. 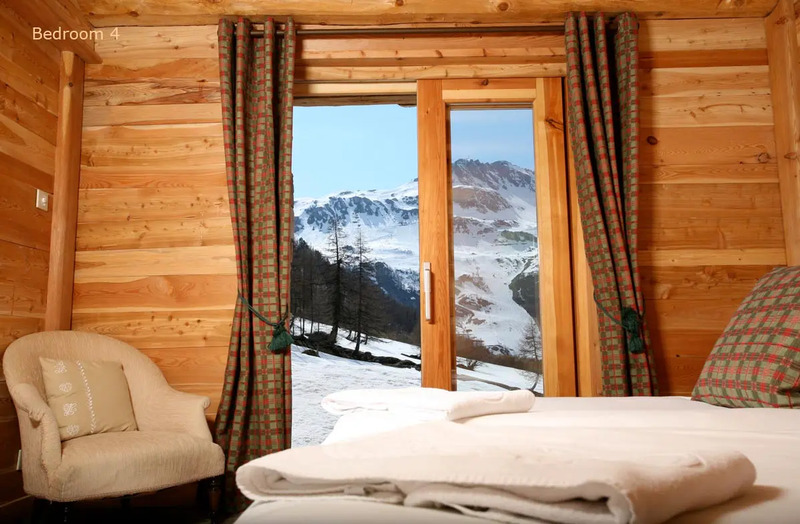 At the other end of the room there’s an equally spectacular view across the bottom of the lovely, smooth L piste and up to the glaciers of the Italian border, to be enjoyed from big, squashy sofas around the log fire. When it gets dark, there’s a flat-screen TV and a selection of DVDs. Or just use the WiFi. 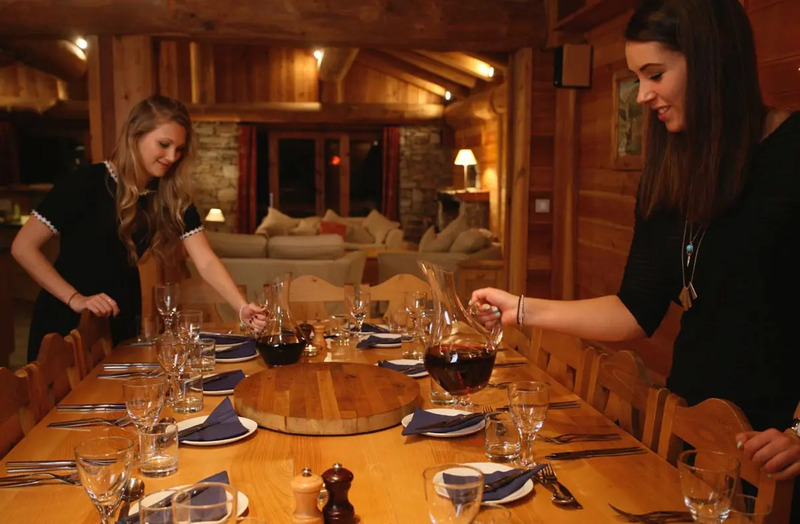 On the ground floor, between the front door and the private lift which whisks you to the bedroom floor or the living room floor, are the ski room, boot warmers, sauna, extra shower and wc, and table tennis table. But what we like best is the location. 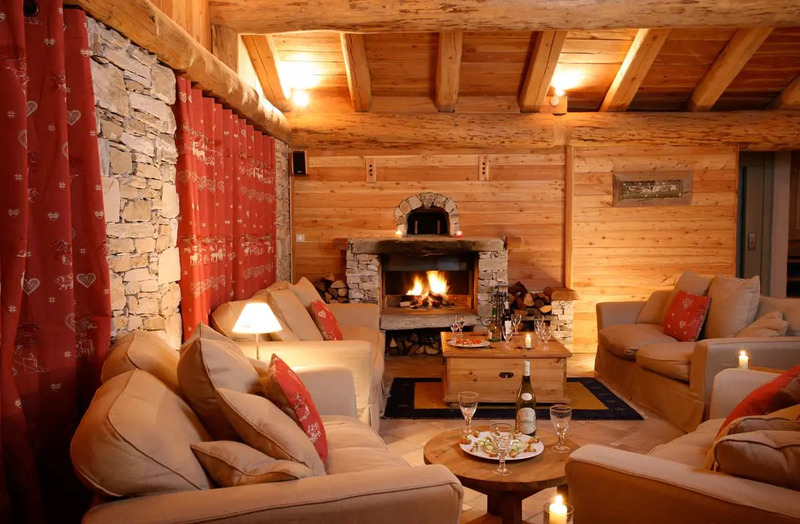 The chalet looks over the charming little hamlet of Le Laisinant, just five minutes’ walk or one stop on the free bus past the edge of the main village, from a position just beneath the Traversée du Laisinant piste. 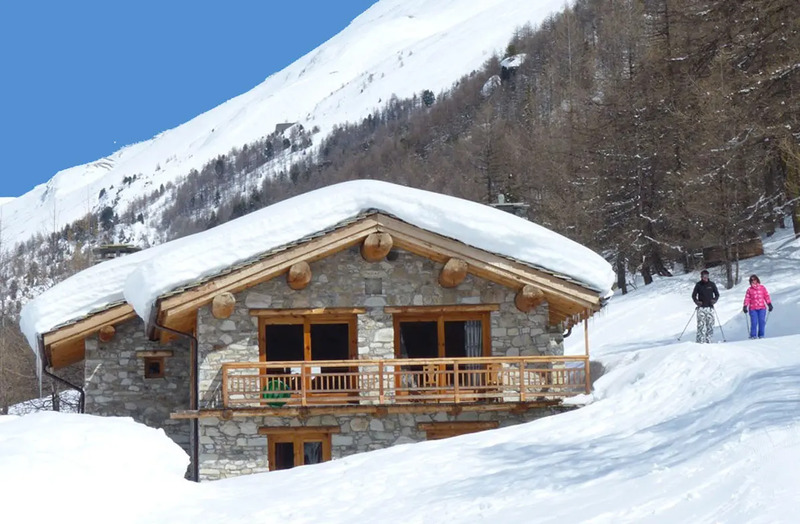 You don’t have to be a good skier to return to the chalet from the bottom of the L or Mattis pistes, while the never-crowded six-seater Laisinant Express chairlift is two minutes’ walk, or a quick pole away. The Laisinant Express was already the quickest way into the Fornet ski area, and now a new run takes skiers straight into the Solaise area, making this chairlift a superbly convenient way to start the day’s skiing. Prices for Winter 2018-19 are shown below. 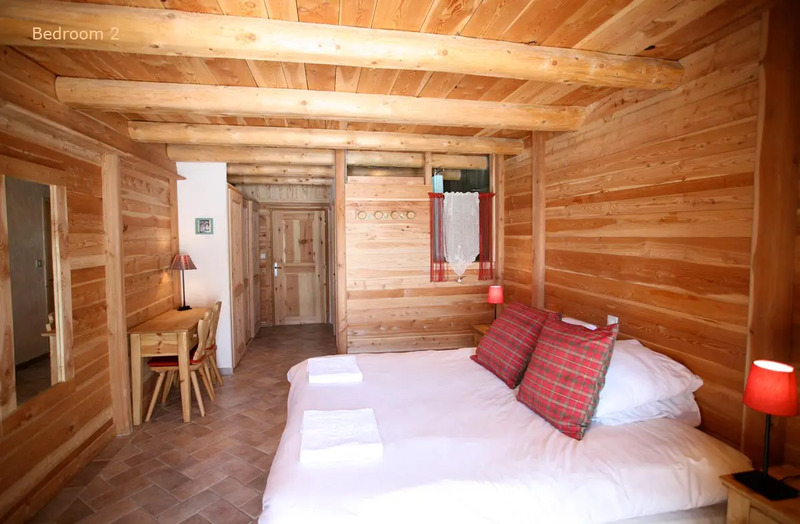 To compare different chalets, please see the full Prices page, and keep an eye on our occasional Special Offers for last-minute deals. Prices shown in red have been discounted. Return flights (from Gatwick) and transfers are provided for all holidays commencing 16 December 2018 to 14 April 2019. Please note the transport arrangements for holidays commencing 9 December 2018 and 21 April 2019. Prices are per person per week in sterling.